On 17 March 2012 the head of the coptic church, Pope Shenouda III, has died at the age of 88. He was the 117th Pope of Alexandria and Patriarch of All Africa on the Holy Apostolic Seat of Saint Mark the Evangelist of the Coptic Orthodox Church of Alexandria and a conservative figure within the Church often critised for his loyality to Mubarak. His episcopate lasted more than 40 years. Hundreds of thousands mourners attended his funeral - about 10 per cent of Egyptians belong to the Coptic Church. One month after the pope's death a 19-member committee has to meet in order to prepare a primary list of candidates with a maximum of 5 to 7 names and to announce it. Afterwards the election day can be set. The election process may take several months. According to Coptic Church traditions, there are three main groups that will jointly elect the pope: 100 to 150 clergymen of the Holy Synod of the Coptic Orthodox Church, 24 secular members of the Millet Council (including some women) and a heterogeneous body consisting of Coptic statesmen, business men, journalists or other notables. They will choose 3 names out of the list and write each of them on a piece of paper. Finally, as a judgement of God, a blindfolded child will choose one of the papers and hereby the next pope. Eligible is every Coptic Egyptian man who is at least 40 years old, has never been married and has been monk for at least 15 years, but is not responsible for a diocese. The favourites so far are: Bishop Moussa (Head of Youth Bishopric), Bishop Youanis (Secretary of former Pope Shenouda) and Bishop Bishoy (Secretary of the Holy Synod and Bishop of Damietta). Bishop Youssef of the South America Bishopric and Bishop Kirollos of Milan have received support from abroad. Mohamed Morsy (Freedom and Justice Party), Abul Ezz el-Hariry (Socialist Popular Alliance Party), Mohamed Fawzy Eissa (Democratic Generation Party), Hossam Khairallah (Democratic Peace Party), Abdullah el-Ashal (Asala Party), Hesham el-Bastawisi (Tagammu Party), Mahmoud Hossam Galal (Kanana Party), as well as independent candidates. Ahmed Shafiq (former minister of the Mubarak era), Amr Moussa (former Arab League head), Abdel Moneim Aboul-Fotouh (Islamist reformer), Mohamed Selim el-Awa (Islamist), Hamdeen Sabbahi (Nasserist) and Khaled Ali (leftist attorney). Campaigning will formally begin on 30 April. Today, the Cannes Film Festival, which will take place from 16 to 27 May, released the official list of films selected in competition 2012. 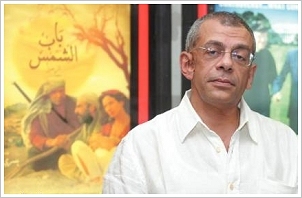 Among the 21 films competing for the Golden Palm Award there is the film "Baad el mawkeaa" ("After the Battle") by Egyptian director Yousry Nasrallah. Originally, it was entitled "Reem, Mahmoud and Fatma" and shows the impact of political events during Egypt’s post-January 25 Revolution period on the film’s characters. Nasrallah was born in Giza in 1952. After studying economics and political science he went to Lebanon and became a journalist. He began his career in film in 1980 as assistant to Volker Schlöndorff on "Die Fälschung". Until now he wrote 9 films and directed 8. 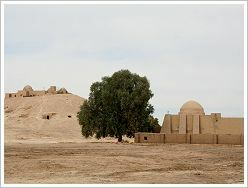 In 2004, his film "Bab El Shams" ("The Gate of Sun") was presented out of competition in the Cannes Official Selection. Update: Ayman Nour, Khairat El Shater and 8 other contenders have been excluded as possible candidates by the Presidential Elections Commission because they do not fill one or more of the required conditions. Nobel laureate Mohamed el-Baradei withdrew his candidacy in January 2012. 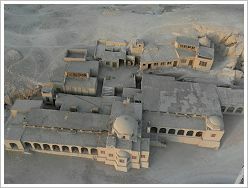 Already in August 2011 we covered an innovative desert housing project. Today, we would like to present another project by which Iranian students won the 1st prize of an international biomimicry design challenge in 2011. Biomimicry (or bionics or biomimetics) is the examination of plants and animals to emulate or take inspiration from in order to solve human problems. For the challenge, the students took the desert snail as an example - an animal that manages for millenia to keep its house cool in the desert without air-conditioning. Its extremely thick white limestone shell reflects 95% of sunbeams, its ball shape minimises thermal absorption. Thus, the desert animal is able to deal with temperatures up to more than 50 degrees above zero for several months. To mimic all these conditions, the students constructed a building with an overlapping and curvy shell to minimize the amount of sunlight that hits any part of the roof and gave it an off-white colour, to reflect the sun's light in addition. As a snail retreats deep into its shell when it gets hot, the building uses this as a model for a series of areas that allow the retreat in increasingly cooler rooms. The model was analysed with regard to its efficiency by a special software and passed brillantly - without any air-conditioning. What a benefit for energy use and ears sensitive to noise! As well the design is very elegant. Let's hope that investors for a prototype will turn up soon. On 16th of April, the Monday following the Coptic Easter, both Muslims and Christians welcome the first day of spring. The holiday can be traced back as far as 2700 BC, when "Shemu" was a religious festival celebrated on the vernal equinox by the Ancient Egyptians. On Sham El-Nessīm ("Smelling the Zephyrs = west winds") the wind is believed to have a wonderfully beneficial effect. 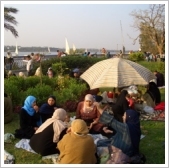 That's why at the crack of dawn Egyptians meet to spend all day out having a picnic in public gardens, on the Nile, or by the sea. 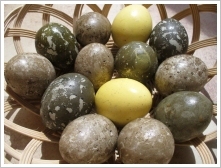 The traditional food eaten on this day consists mainly of ful midammis, fasīch (dried, salted fish), lettuce, scallions and ... coloured boiled eggs :-). 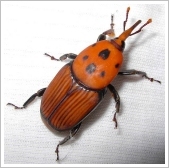 The red palm weevil (Rhynchophorus ferrugineus) originates from South-East Asia. From there, it came via Middle East to Egypt and spread to Europe, reaching the Mediterranean in the 1980s. It threatens many palm tree species as soon they reached a trunk diameter of 5 cm. Then, the adult female palm weevils lay approximately 400 eggs on new growth in the crown of the palm, at the base of young leaves, or in open lesions on the plant. The larvae (sago worms) burrow metre long holes through the trunk into the heart of the palms. The palm leafs of the crown wilt first, lower leaves follow, the trunk rots, the plant dies. The symptoms are visible long after the palm has become infested. The process takes only about 7 - 10 weeks and the weevil, which is able to smell a palm over a distance of 20 km, continues on the next plant. Once infected the palm trees must be cut in small pieces and burned to avoid further damages to other plants. All other measures don't work or are very costly and time-consuming. In its Malayan homeland the sago worms are considered a delicacy. They are eaten raw, smoked, roasted or steamed in banana leaves and are regarded as a special high-nutrient meal. Until now, in Luxor only a few infested palm trees are apparent (see the picture below). Possibly, the weevil, which is able to deal with temperatures up to 50 degrees above zero, can't survive the summers in Luxor... It is much to be hoped! 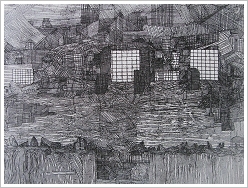 Tomorrow, 11 April 2012, 6 pm, British artist Euphemia MacTavish who has been working in Egypt over 20 years will present six etchings inspired by Ramesseum at Marsam Hotel. Entrance free. That replicas of ancient Egyptian artefacts are designed for looking genuine is usual. However, this time it was quite the reverse: This week the Israeli authorities seized 2 ancient sarcophagus lids in Jerusalem stolen and illegally smuggled out of Egypt after being modified to appear as fake replicas. 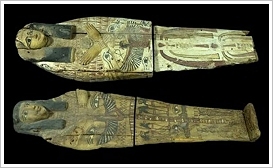 Egypt has already asked for the artefacts' repatriation. Also this week a Belgian court ordered the speedy return of 80 smaller Egyptian artefacts after they were found genuine. Already in 2010, they were stolen and smuggled out of the country by an Egyptian woman. The Belgian customs unit caught her at Brussels as she tried to import two large wooden replica statues in which she had conceiled 11 small wooden and limestone statuettes, 11 amulets and 27 scarabs from the ancient Egyptian era; Islamic cylindrical seals; a Coptic child's robe and a small decorated piece of textile; a lion-shaped Ptolemaic pot and a prehistoric clay pot. Next Saturday, 7 April 2012, the weekly lecture will not take place at the Mummification Museum but at the Nile Valley Hotel on Luxor's west bank at 7 pm. Marcel Maessen will speak about the history of the dig houses in the Thebes area. Among them are: Castle Carter I and II, the Theodore Davis House, the Stoppelaëre House, the de Garis Davies House and the Metropolitan Dig House. Marcel Maessen is owner of the website Uncovering the history of dighouses. 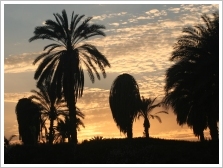 On Tuesday 17 April 2012, a great event will take place at Royal Golf Club Luxor. From 2 to 10 pm the following artists are on the agenda: DJ/Producer Momo Rivera, Luxor Best Dance Crew, poet Hisham El Gakh, jazz singer Michelle Rounds, guitarist Motreb al Sawra, singer El Hawees, super star Hamza Navira. Furthermore, you can join Luxors 1st Rainbow Colour Festival. 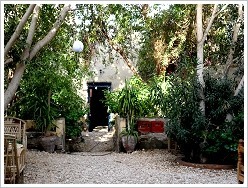 The club is situated on Theba Road beside the Airport. Tickets starting from 65 LE (inluding shuttle bus) are available on the festival's facebook page. A part of the proceeds of the sale will be of benefit to ACE in Luxor.